Published on August 31, 2012,	by JazzWeek in News. 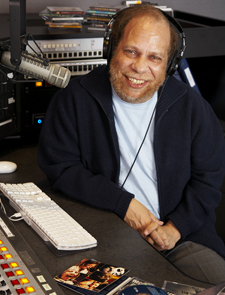 DETROIT — Legendary WGBH jazz broadcaster Eric Jackson was named the 2012 recipient of the Duke Dubois Humanitarian Award, presented each year to an individual whose dedication to jazz and jazz radio has been exceptional. The Duke Dubois award and awards in 11 other categories were presented at the annual JazzWeek Awards dinner as part of the JazzWeek Summit on Thursday, August 30, at Redsmoke Barbecue in Detroit. Four winners were announced in Station of the Year categories. In markets 1-25, the winner was KMHD, Portland, Ore.; markets 26-79, WWOZ, New Orleans; markets 80+, KCCK, Cedar Rapids, Iowa; internet and non-terrestrial, JazzRadio.com. Four radio programmers were recognized in similar categories. In markets 1-25, Linda Yohn, WEMU, Ypsilanti, Mich., was named programmer of the year; markets 26-79, Brad Stone, KSJS, San Jose; markets 80+, Bob Stewart, KCCK; internet and non-terrestrial, Scott Willis, JazzRadio.com. Groov Marketing and Consulting, co-owned by Josh Ellman and Mark Rini, was named promotion company of the year. Record of the year was The Good Feeling, Christian McBride Big Band, Mack Avenue Records. Label of the year was HighNote Records. The JazzWeek Summit is an annual conference focusing on programming, promotion, business and technology issues facing jazz radio and jazz record promotion. Comments Off on Eric Jackson chosen as 2012 Duke Dubois Humanitarian Award winner at JazzWeek Awards.